When I built out my basement man-cave, I wanted to do something unique with accent lighting. 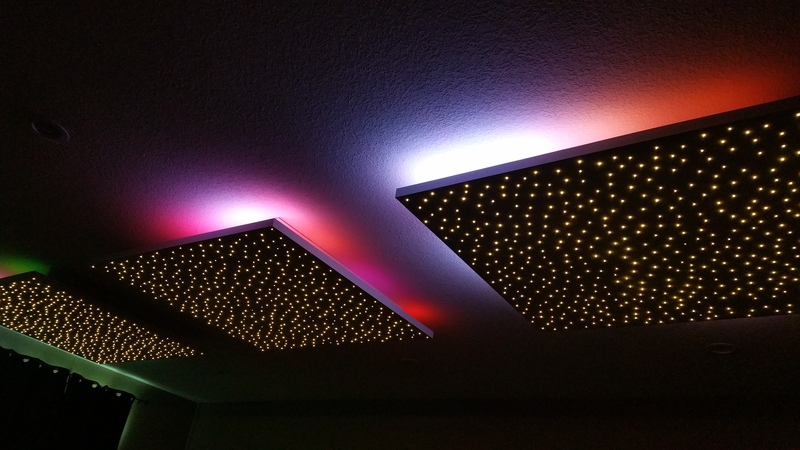 I designed and built three light boxes that I attached to the ceiling. 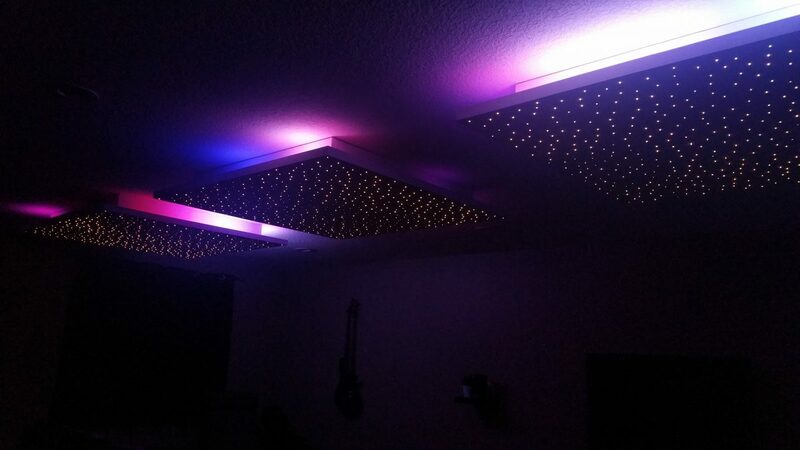 On the bottom are dimmable warm-white LEDs, randomly dispersed to mimic stars. 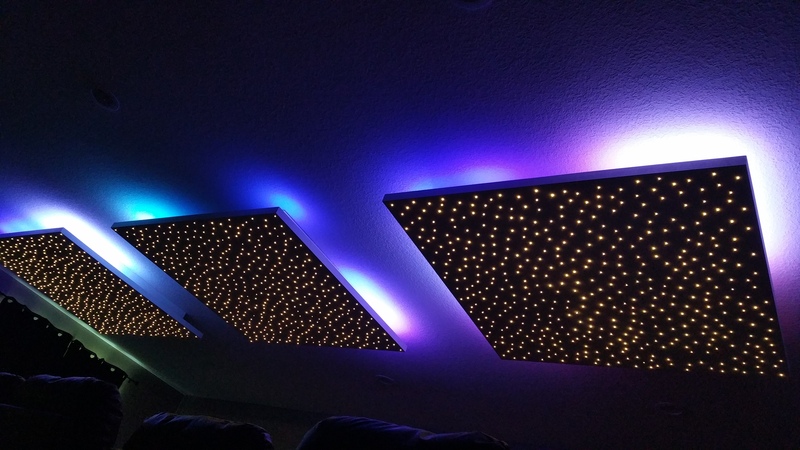 This creates a great ambiance for watching movies. 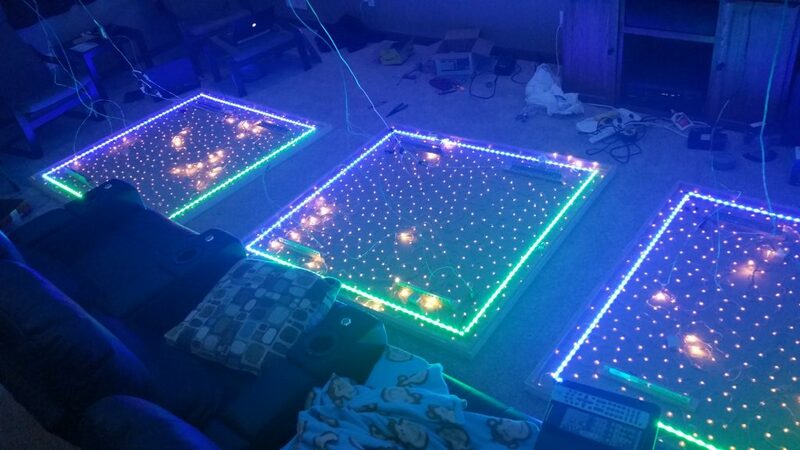 Around the edges of the top of the boxes, WS2812b RGB LED strips make party mode a reality. Assembly begins! 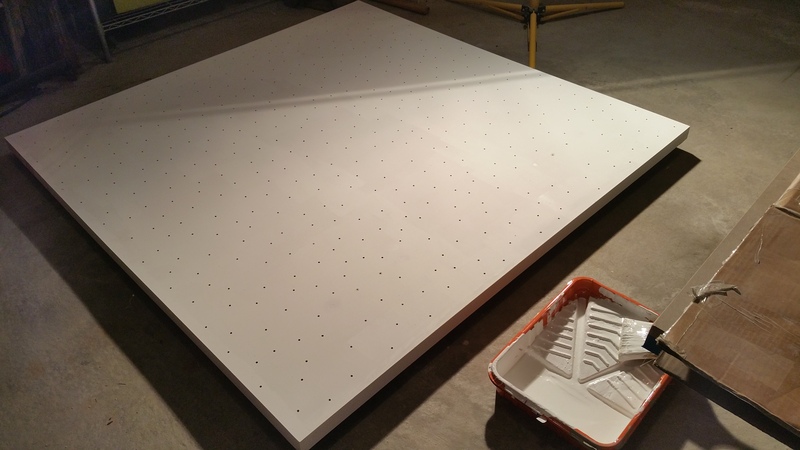 The bottom box measures 5′ x 5′ and is made of MDF. 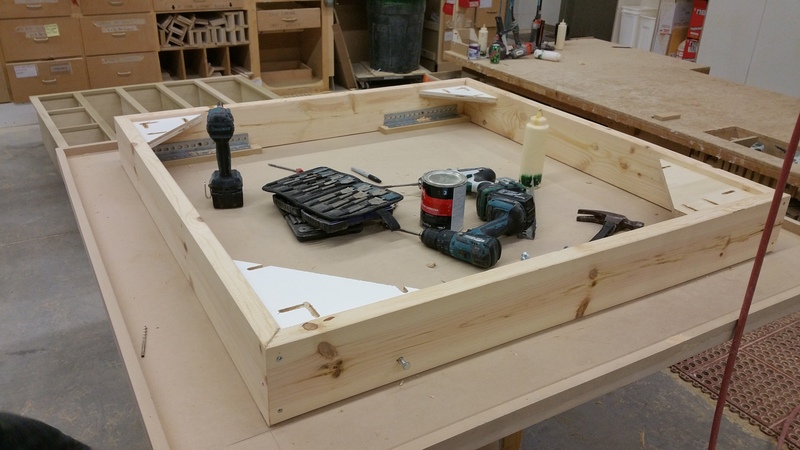 The upper box measures 4′ x 4′ and is made from 2x6s. The bottom section is detachable from the top by removing bolts along the sides. Once the boxes were assembled, it was time to layout the stars. 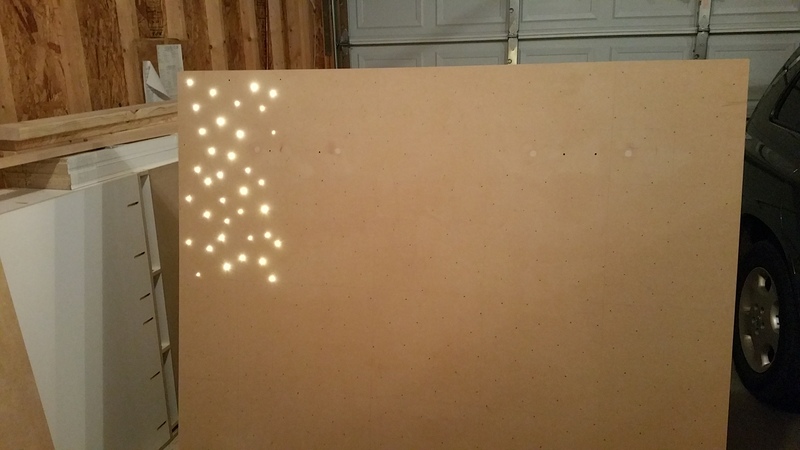 I sectioned off the boxes into 25 squares and randomly filled each 1′ with the same number of dots. With minor tweaking, it made for a fairly random, but even distribution. 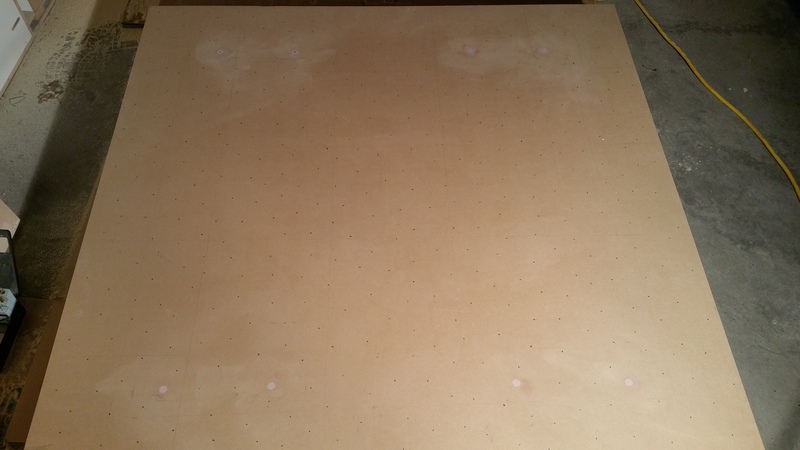 With some uncertainty, I began drilling the first few holes. Each of the 3 light boxes contains 500 holes. Each hole was drilled twice. This was to provide a consistent depth for the LEDs. First a narrow hole was drilled through the board. Next a slightly wider hole was drilled from the back-side, stopping short from going through the board. This allowed the LEDs to be pushed in from the back and stop at a consistent depth. Initial tests proved that this was going to be a success. Next stop, paint shop. I used the same paint that was used to paint the ceiling. 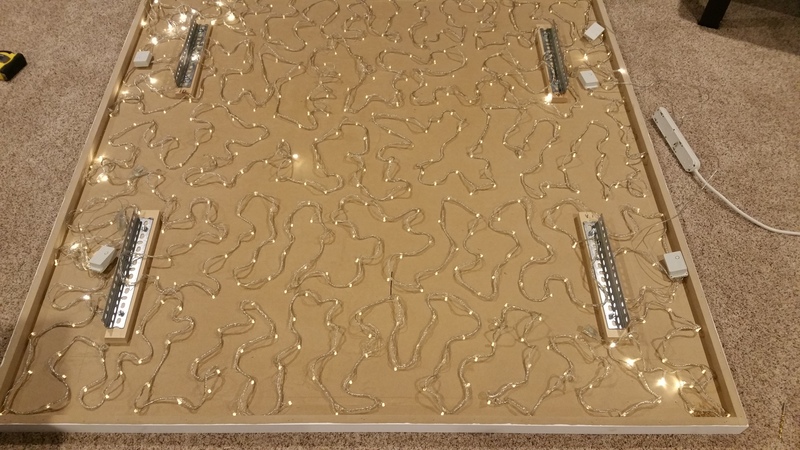 The down-facing LEDs are simply warm-white LED Christmas lights. They didn’t fit as snugly as I had planned so each one was hot-glued in place. 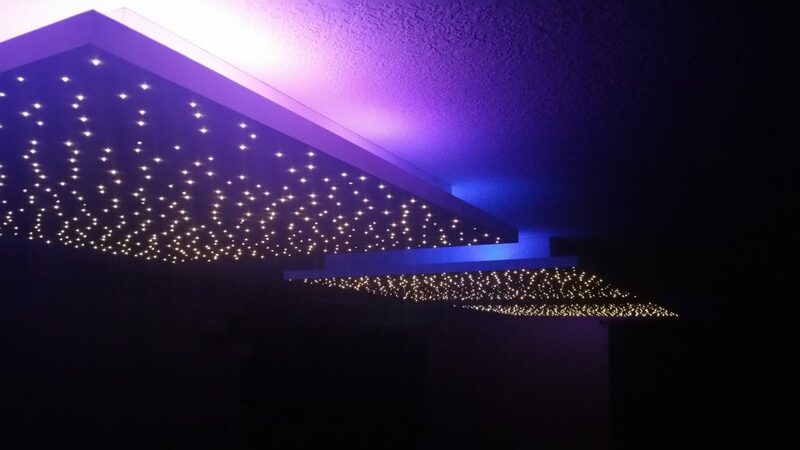 The lights were planned before the room was finished so I was able to place the required high and low voltage circuits appropriately. The upper boxes were mounted securely to the trusses. 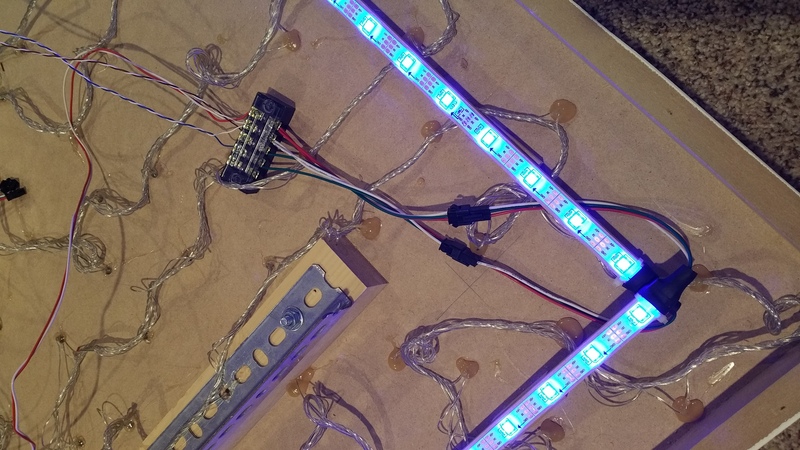 A raspberry pi is connected to 3 fade candy boards which drive the WS2812b LED strips. The pi contains a default sequence, or a networked computer can connect to the fade candy server and control the lights remotely. That’s a fade candy. 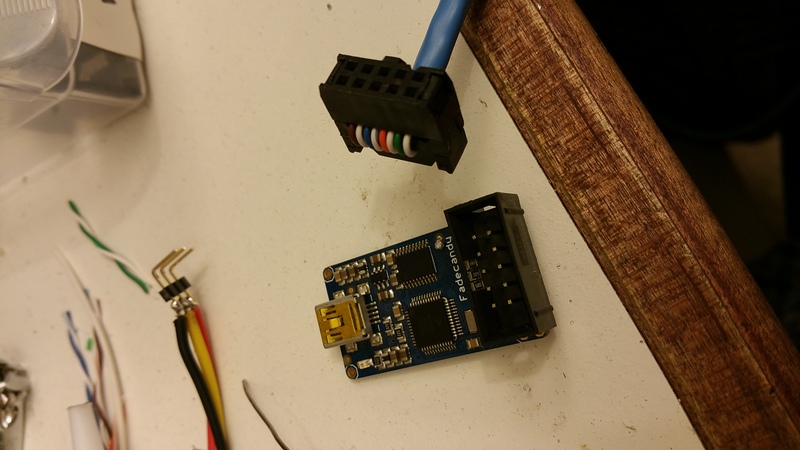 I made an IDC connector with 4 data channels + 4 grounds. I found that over distances longer than a few inches, it helped to have each data chanel in a twisted pair with it’s ground. 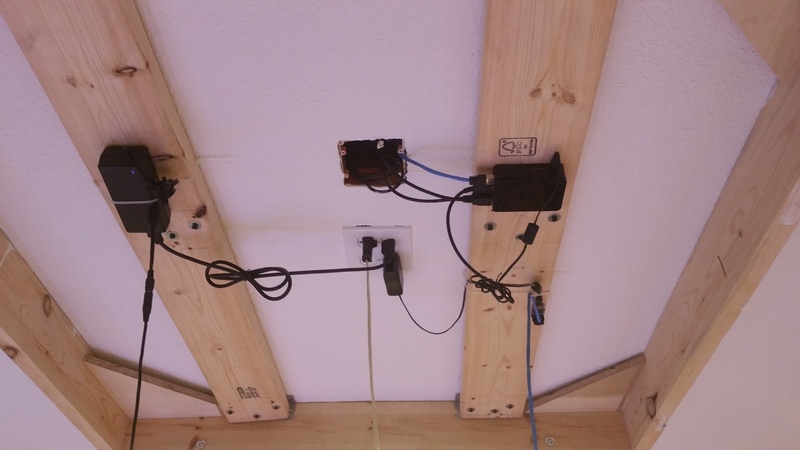 On the other end, screw terminals and JST connectors get the data signals and power to the LED strips. There was a reason for having two disconnects. I think. Fully wired up. Things start getting exciting. Final testing on the floor.